We use modern equipment that is updated with the industry standards. 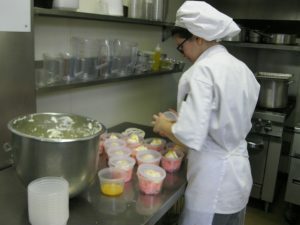 Culinary is a production shop. We serve the community needs and school functions. Plus, we also have an everyday hands-on dining room operation serving 50-100 people a day. We also have a full bakery wholesale department which is open to the public from 10:30 a.m. – 12:30 p.m. daily. The Articulation Agreement between the Old Colony Culinary Arts Tech Prep Program and Johnson and Wales University has been renewed. Students qualifying for the program receive the equivalent of one term of transfer credits (15 quarter credit hours) when enrolled in Johnson & Wales University Freshman Advanced Study Track Program. The successful completion of a 3-year Culinary Arts Program qualifies Old Colony students for the F.A.S.T. Program. The Articulation Program is a cooperative venture between Old Colony and Johnson and Wales University to eliminate repetition of training, provide advanced placement opportunities to vocational technical students and to save time by granting advanced placement and college credit for previous learning. Old Colony Regional Vocational Technical High School Articulation Agreement Program extends to New England Institute of Technology, Bristol Community College, and Wentworth Institute.